It’s beginning to sound redundant, this price action within a fairly well defined trading range. For the time being, I’ll call this range an attempt to “build a base”, presumably for a potential move higher (though it could also be re-Distribution too). What stands out on this chart is the big volume spike on Friday. OK it’s the third Friday (options and futures expire then) so it may have little price impact. We’ll need to wait until Monday for that confirmation. So we bounce between 4905 and lower. Noting that there is a nice slope upwards in the price range and Money Flow and Sentiment has turned Bullish. There is buying (the green vs. red lines) but it’s not that enthusiastic . . . yet. So the FED watch is over for now and rates remain where they have been, very low. I have a suspicion that next week will provide us some modest indication of whether we can break out of this range or sink down to it’s lower edge (4565). There are a few areas that are showing decent strength. 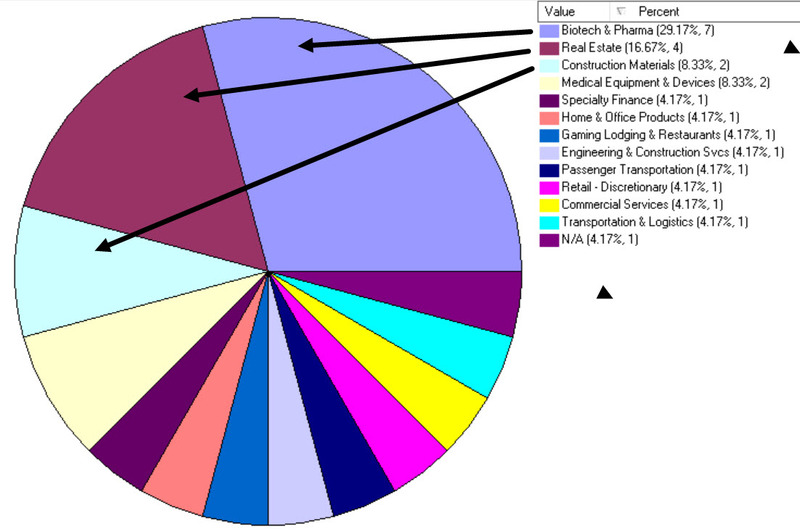 The pie chart shows the sectors of the stocks that I’m watching. That’s about it for now. Have a good week. ……….. Tom ………..